If you are a sucker for attention, then perhaps you might want to check out the $7.99 Eat’N Tool Dark Edition, which is definitely not something you would see on the dining table every single day. 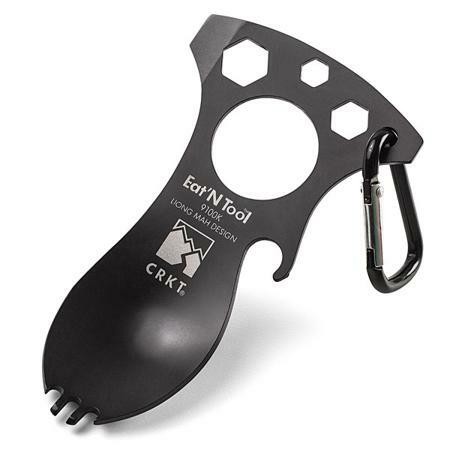 This is truly a unique tool to carry around, where it has been described as the ultimate multi-tool, doubling up as an eating utensil, too! It does not matter whether you are in a tight position, you will still be able to have your spoon, fork, bottle opener, screwdriver/pry tip, metric wrenches, and carabiner with you. Not only that, the Eat’N Tool Dark Edition will not bog you down on your travels, considering it tips the scales at a “mighty” 1.5 oz. Invented by NYC designer Liong Mah, it does resemble a distant cousin of the spork at first glance, but also comes with a plethora of other capabilities as mentioned above. The trio of metric wrench reliefs (10 mm, 8 mm, 6 mm) should come in handy in tight spots for sure! There is a large central hole that is suitable for finger gripping, while it ensures the tool remains nice and light.